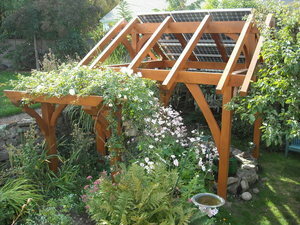 The "structure" is part gazebo, part trellis, and was built from a timber-frame kit. The rose trellis was custom designed and built to match its big sibling. 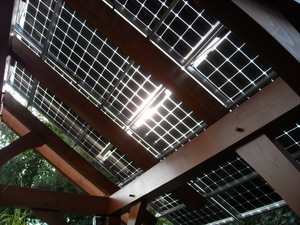 Translucent PV panels let some light through, while providing enough shade to minimize algae growth in the koi pond. It started a few years ago, when we did a seismic retrofit on Phinney Ridge. Then this year (2009), we got a call from our clients, who wanted to talk about another project. They weren't sure exactly what they wanted, but it had to create enough shade to keep algae from taking over their koi pond in the summer. And it had be attractive and fit into the very pleasant garden oasis. Then there was the heirloom climbing rose whose trellis was rotting out from under it. Our solution: a timber frame gazebo and matching rose trellis. We designed and built them, then our clients made the call as far as what to cover the gazebo with to create shade. Their decision: photovoltaic panels on the southern facet of the roof, extending just beyond the lower ends of the rafters. Northwest Mechanical did the solar installation, and it came out awesome! Now in the works, an awning over the back deck with evacuated tubes for solar hot water. Stay tuned for more photos.